Although 1868 is Monastery Hill’s celebrated year of origin, its story actually begins years before in the small town of Gramzow, Germany. That was when the original founder, Ernst Hertzberg, began learning the craft of bookbinding. In his early childhood, Ernst had often played on the ruins of an old monastery outside of town. 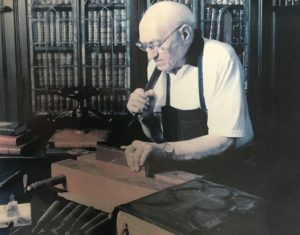 The young boy quickly developed an interest in the scribing and binding practices of the monastery’s former monks, and at only eight years old, Ernst began apprenticing with a local bookbinder. A short time later, Ernst immigrated to the United States and started his new life working as a helper in a Chicago lumberyard. Because of his early experience with bookbinding, however, he soon landed a job with Ringer Book Bindery located on Randolph Street, just above the legendary Henrici’s Restaurant. Within ten years, he was given the opportunity to buy into ownership of the firm. 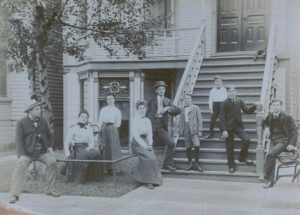 In 1902, the bookbinding business moved to its current location on Belmont Street in the Chicago neighborhood of West Lakeview. In the early years of the business, Ernst Hertzberg produced some truly notable bookbinding masterpieces. One particular work was a twelve-volume set entitled Sloan’s Life of Napoleon Bonaparte. Ernst meticulously assembled the set from a collection of over 150 letters he had purchased, which contained correspondence between Napoleon and many of his generals, dignitaries, and friends. The unique set also included maps depicting Napoleon’s campaigns and battle plans as well as over 4,000 steel and copper engravings of people, places, and events involved in Napoleon’s life. Ernst finished the set by binding the books in a beautiful green crushed Moroccan goatskin with gold-tooled emblems and designs. When the set was finally complete, his achievement won the gold medal for bookbinding at the 1904 St. Louis World’s Fair and sold three years later for $12,000 (which is around $300,000 in today’s dollars.) Even today, it is considered one of the most elaborate and unique sets of books in existence. It was eventually donated to the University of Iowa Library, where it remains to this day. 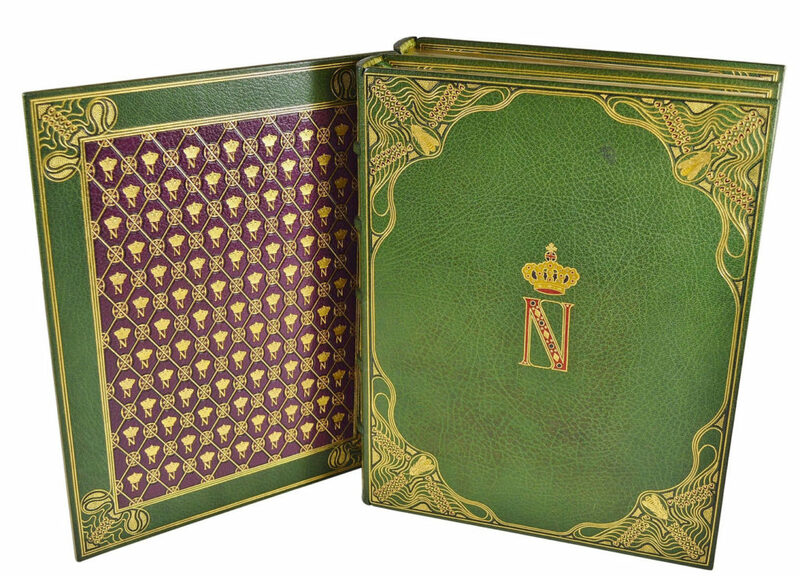 The Napoleon set is significant to the company’s history because Ernst used the proceeds from the sale to buy out his partners at Ringer & Hertzberg Bindery. He promptly changed the name to Ernst Hertzberg and Sons, Monastery Hill Bindery. The name “Monastery Hill” was chosen in remembrance of the ruins of the ancient monastery in his hometown of Gramzow, which inspired his career. 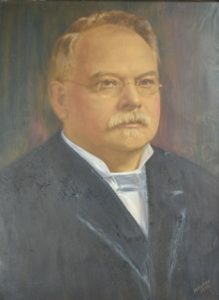 Hertzberg worked for forty-nine years in Chicago. He hired and trained many brilliant bookbinders, all of who helped establish Monastery Hill Bindery as a premier business in the trade. In 1918, Ernst passed away and was succeeded by his oldest son, Edward. Like his father, Edward was a superb binder, and under his tenure, the reputation of Monastery Hill continued to grow. Chicago libraries were being amassed in the early 1900’s, and Monastery Hill gained national prominence as a fine binder. By virtue of his meticulous nature, Edward Hertzberg was known to be a difficult man to work for. As a result, his four brothers eventually left Monastery Hill to start their own binderies in Milwaukee, St. Louis, Des Moines, and Spokane, Washington. However, Edward was a perfectionist and an excellent teacher, and he was able to teach the bookbinding trade to many Monastery Hill employees, including the legendary Joseph Zuffant. Undoubtedly, the most dedicated employee in Monastery Hill Bindery’s history was Joseph Zuffant. He was a prodigy of Jane Addams Hull-House who in 1925 placed him as a book binder at Monastery Hill at the young age of 14. He went on to bind thousands of books and worked at Monastery Hill for an impressive seventy-three years until his death in 1997. Over those seventy-three years, Joe famously only missed six days of work. In fact, Joseph coined the slogan, “The difficult we will do today; the impossible will have to wait until tomorrow,” which Monastery Hill still uses to this day. 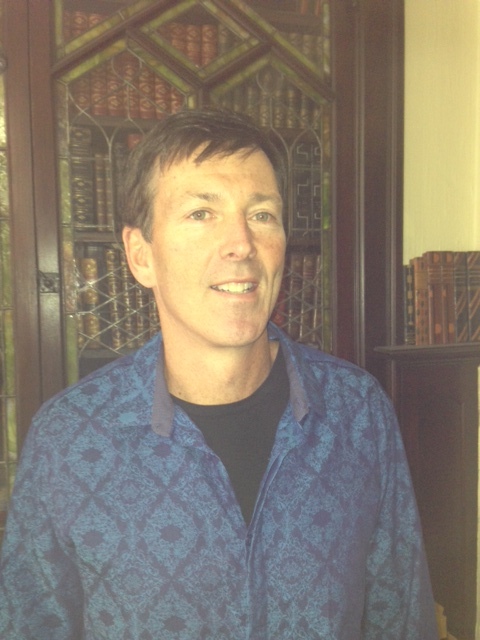 Joe would describe the elaborate libraries that many wealthy people would have in their homes during the era. They would bring their books to Monastery Hill to be beautifully bound, so that the books could be displayed as showpieces in their libraries. He often remembered notable people who used Monastery Hill’s services over the years, including Charles Deering, Mrs. Cyrus McCormick, Marshall Field, Carl Sandburg, and Frank Lloyd Wright. Under Edward’s tutelage, Joe blossomed into a world-class bookbinder. Edward died in 1935 and was succeeded by his only son, Lawrence. Lawrence took over the Bindery during the Great Depression, and as the country’s personal wealth decreased, so did the demand for custom leather bookbinding. Lawrence was required to invent new ways to make up for the lost revenue. His idea was to enter the library bookbinding business. 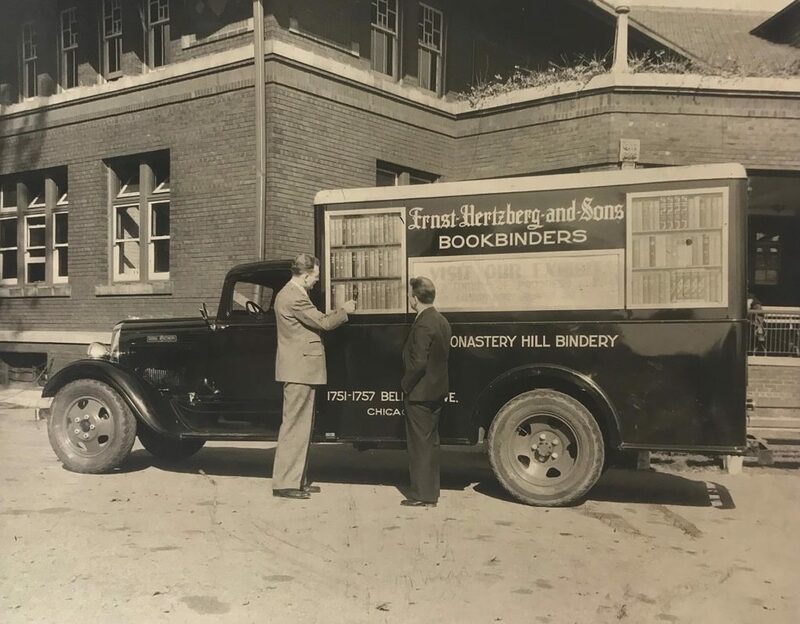 Monastery Hill would send the Hertzberg trucks to elementary schools, high schools, and college libraries to pick up their worn books and journals for binding. Instead of leather, the books were bound in buckram, an inexpensive but durable bookbinding material. The business grew steadily, and by 1953, it was stretching the bindery’s capacity to its limit. It was then that Lawrence chose to merge the business with two other companies, Bound to Stay Bound and Library Binding Services. The new company, called Hertzberg – New Method, combined the talents and services of all three companies and offered custom leather binding, pre-binding of children’s books, and end sheet manufacturing for children’s book covers. In 1954, a new plant was built in Jacksonville, Illinois, and the newly merged company soon became one of the largest and most important binderies in the country. Lawrence, who lived in Barrington, Illinois, would commute into Chicago to Monastery Hill Bindery twice a week. The rest of the workweek, he would drive 230 miles to Jacksonville to help run New Method. He was made president of the new company and established himself as an industry leader. Perhaps his biggest contribution to Hertzberg – New Method, however, was his development of a patent called Perma-Bound in 1960. The Perma-Bound method, which worked to reinforce the binding of paperback books, quickly exploded into huge business for the company. When he died in 1970, Lawrence left Monastery Hill to his two daughters, Rhoda and Rita. At the time of their father’s passing, Rhoda lived in Jacksonville, and Rita lived in California, which quickly presented a logistical problem for the sisters and threatened the future of Monastery Hill. They were faced with a decision to sell the company or find a manager to help them run the business long distance. After careful thought, they chose neither. They would not sell the company. Rhoda would take on the responsibility of running Monastery Hill herself. Like her father, Rhoda committed to making the long commute every week, flying in and out of Chicago’s Meigs Field. She would return to her home in Jacksonville every weekend. Her presence breathed new life into the old company. With her vast knowledge of art, she offered to sell to her customers various etchings, lithographs, engravings, and bookbindings that she purchased from auction houses around the world. Her talent in the area became so well known that she was often commissioned to buy art at auctions for various businesses. In fact, she purchased several million dollars of art for RR Donnelly printing company’s corporate collection. This new source of revenue revived Monastery Hill, but the binding business began to decline further in the 1980’s. “Bookbinder Extraordinaire” Joe Zuffant was then seventy-eight years old. The time, money, and commitment it would take to train new bookbinders came into question with the new declining trends. In 1988, Rhoda hired her son, Blair, who had just graduated from the University of Illinois. Blair quickly realized that Monastery Hill’s days of custom bookbinding might be coming to an end; the company needed to develop a new revenue stream with a fresh customer base. 1989 marked the beginning of the Monastery Hill Bindery we know today—a supreme manufacturer of luxury amenities for the hotel and restaurant industry. 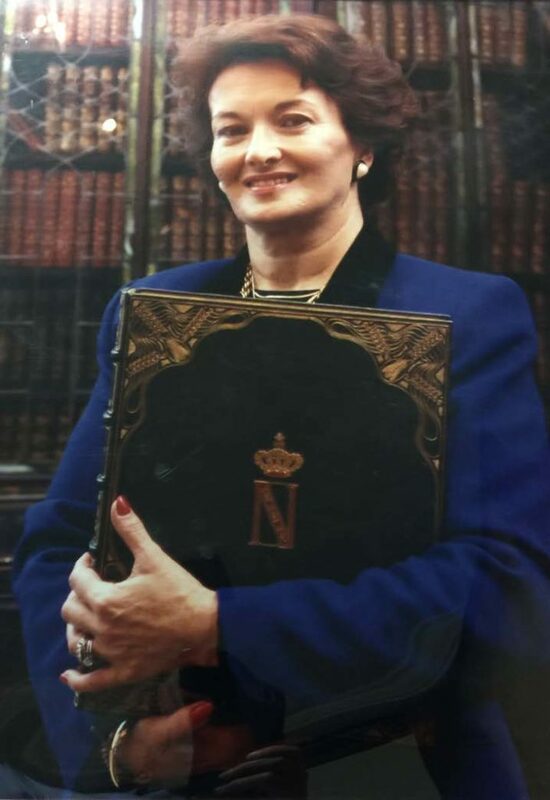 In 1996 Rhoda retired to her home in Jacksonville and Blair took over as president of the company. Blair has been running Monastery Hill for over 20 years, and he has grown the company to be a leader in the hotel and restaurant industry. The company continues to be committed to embracing the future while still celebrating the past. In fact, many of the old bookbinding machines are still used to manufacture Monastery Hill’s modern menu covers, guest service directories, and luxury hotel amenities. Their expertise of manufacturing and fine bindings easily translated to creating beautiful covers for the world’s finest hotels and restaurants. In addition, Monastery Hill is proud to honor its rich history and values by continuing to manufacture in the United States and at the same location on Belmont Street in Chicago where Ernst Hertzberg first moved his business in 1902.